Large parking lot located right in front of the restaurant in the Beaver lake Shopping Center. Full service catering company that can accommodate any type of event or cuisine needed. Ambrozia Bar and Bistro is a neighborhood café located in North Asheville next to scenic Beaver Lake. It features modern American cuisine with a twist. 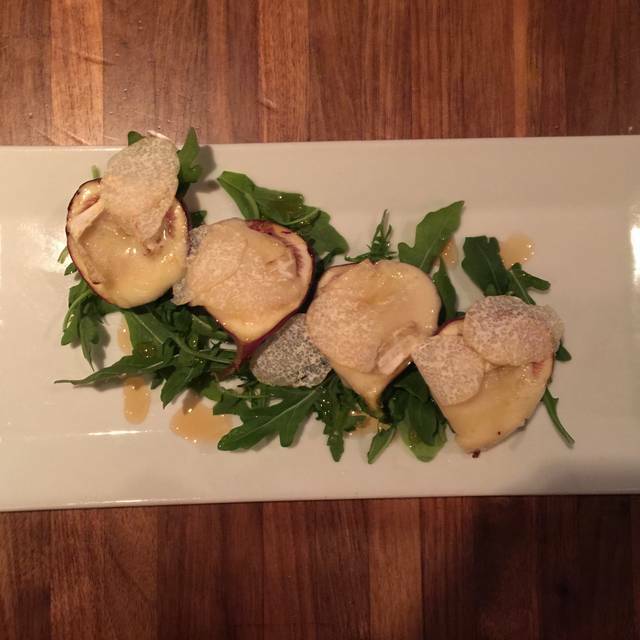 The ever changing menu specializes in farm fresh local ingredients. The quaint atmosphere is modern and comfortable. The Bar is wine focused with local and craft beers, specialty cocktails and a full service bar. Professional and knowledgeable service can be expected from the friendly Ambrozia staff. Open for dinner and Sunday brunch with ample parking in the Beaver Lake Shopping Center. Reservations are recommended. We had dinner on the last night Ambrozia was open. As it has been for almost 6 years, the food and service was outstanding! Chef Sam and his team have provided wonderful, changing menus to keep us locals coming back every week. We forged some great friendships at Ambrozia and will cherish lasting memories from our times there. We wish Chef and all the great staff all the best going forward! Great as always. Everything we ordered from the pimento cheese to the buttermilk dressing salad(our favorite) to the entree, which was steak and stuffed quail was delicious. We are going to miss Ambrozia in our neighborhood. It was always a great place for a special occasion or just because. Best of luck to chef Sam and all the staff. I really hat to see this place close. 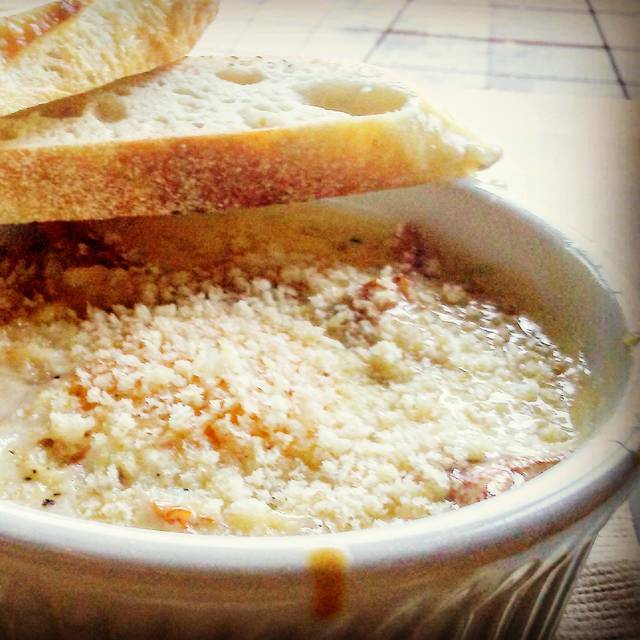 It became one of our favorites, both for brunch and dinner. The food was always fresh and presented beautifully, and the crafty drinks were consistently great. Our server, Andrea was terrific. She was personable, well versed in both wines/cocktails and the dinner menu. Chef Sam’s soft shell crab was incredibly delicious and desserts light and refreshing. Went for a Saturday night date and we had the deviled eggs, sweet potato tots, spaghetti squash, and smoked salmon. Everything was great! The skillet yeast rolls are a delicious treat that I could have eaten all night. Already recommending this place to friends and will definitely return. 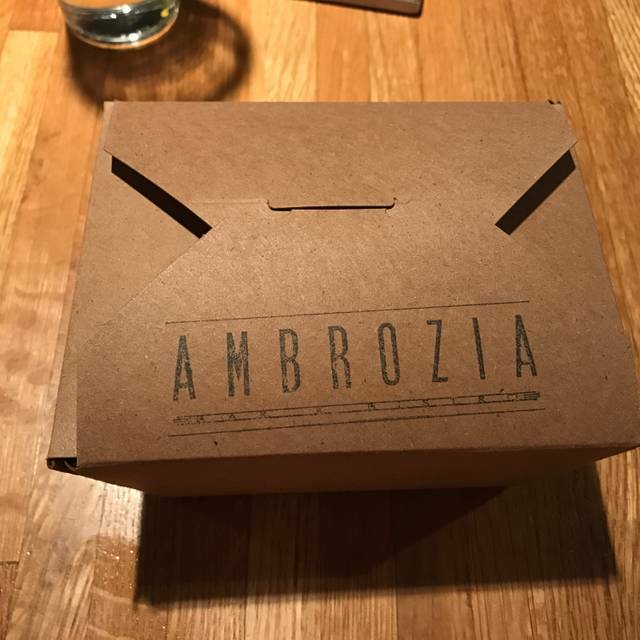 This was our second time at Ambrozia, and our friends’ first time. We all enjoyed our meals and had excellent service. We sat on the bar side, which was a tad noisier, but we really enjoyed our experience. I went to Ambrozia with a friend for dinner. Cutting to the chase, we each ordered roasted spaghetti squash cooked amazingly—better than I’d ever tasted it; it contained prosciutto, basil, pine nuts, and brie. This was followed by a plate of lion’s mane mushrooms, again prepared delectably in aged sherry vinegar. Because we felt as if we deserved yet another reward, we ordered a chocolate lava cake, topped by warm raspberry compote—to share; though it was large, it was so good, we ordered and shared yet another helping. I went home and told my husband about the meal. The next evening, he and I were back at Ambrozia. In addition to repeating the exact meal and dessert I’d had the night before, my husband added an order of steak frites to his dinner; it was accompanied by Brussels sprout slaw. I got to share some of his steak, and it was wonderful. Our server, Kate, was a delight (both evenings). We were a party of 6 celebrating our son's engagement and had a delicious dinner with excellent service by Mike. The menu was very diverse and we all ended up ordering different items along with appetizers for the table. We all had to try each other's dishes because they were all so good. We live in Asheville and go out to eat often, so I know how hard the competition can be. I believe Ambrozia is a true hidden gem. 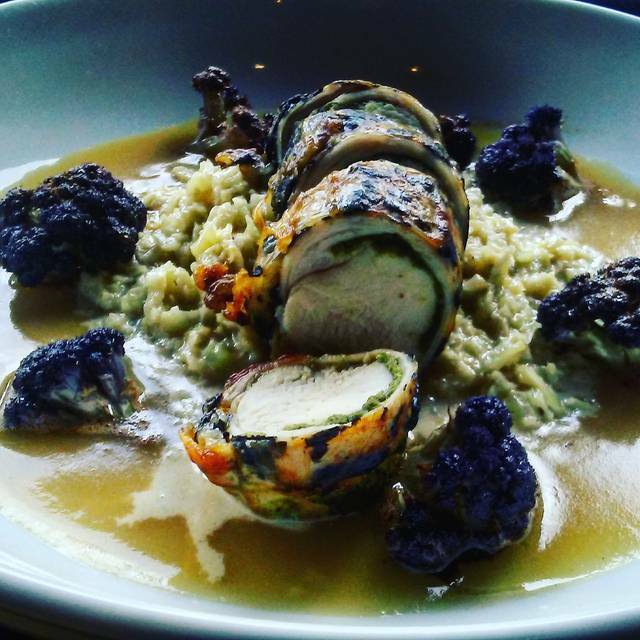 Plenty of parking and a great culinary experience make this restaurant a Must Go. Wonderful service and excellent food. Highly recommend. They offer a four course brunch menu and ala Carte as well. The four course servings are delicious, perfect serving size and change weekly. My only negative was noise level. There was a woman playing guitar and banjo as well as singing. The volume was a little loud, consequently conversation got louder as well. Was still enjoyable brunch and will definitely return. Dining at Ambrozia is truly a pleasure. There are so many dishes to try; we were planning our return visit before we were served our entree! Each dish was interesting and delicious. Our waiter was attentive and congenial. The ambiance was peaceful, though visually stimulating with an enticing art display to enjoy. All was excellent...drinks, food, atmosphere, and service. Will return soon. Not as good as usual this time, but we still love the Tuesday night beer'n'burger special. Food was not hot, room was cold, but we still ate every crumb, and as usual, we encountered friends with whom we caught up during the visit, a frequent bonus at this neighborhood favorite. Amazing brunch! I was visiting Asheville with friends and we were looking for a good spot to grab brunch before heading back to our various lives. As a former fine dining restaurant manager, I am a bit picky. I picked the restaurant because it was close by and got excellent reviews. We were not disappointed. I will admit I was initially throwing off by the exterior (does not have the outside look of a typical fine dining establishment I expected) but it didn't matter. All but one of us got the "price fix" brunch for $20. I can tell you it was one of the best $20 meals I've had in a long while. I had an a amazing salad and beef cheeks for the entrée. Perfect! My friends meals were equally fantastic according to them. Service was on point. Waitress (I'm sorry I can't remember her name but she had dark hair and glasses). She was patient with us even when two of our friends were late. About half way through musicians came. They were outstanding also. I would def recommend this place to those nearby or visiting! This a wonderful place with great food and the friendliest service in town. This was our first visit and we weren't impressed. 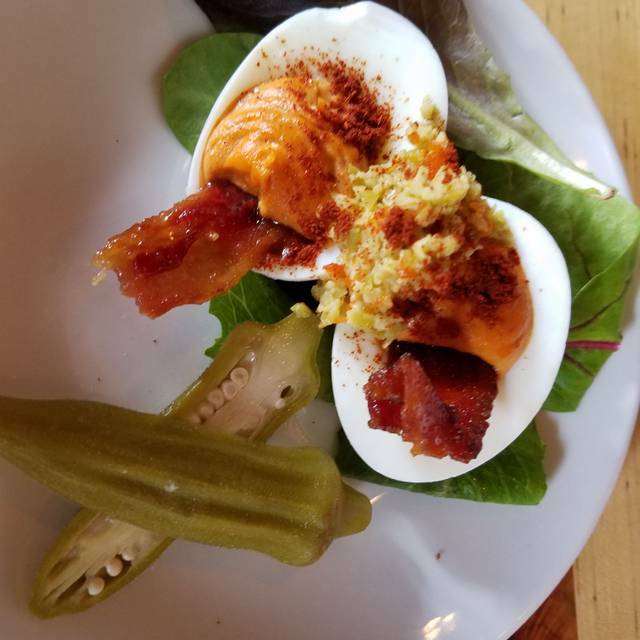 Things started out good with the deviled eggs, but the rest of the food was just meh. Plus, the fries and chips were brought to us in these super greasy bags, which was unappetizing. No one wants to be reminded that they are eating something greasy and fried with one of these on their plate! I addition, the portions seemed a little skimpy. But the worst thing had to be the bathroom. When I walked in it looked like I was walking into a frat house bathroom. Trashcans were overflowing and the sink and ledges were all wet. It would have taken someone two minutes to straighten it up. Needless to say, we won't return. Outstanding as always! 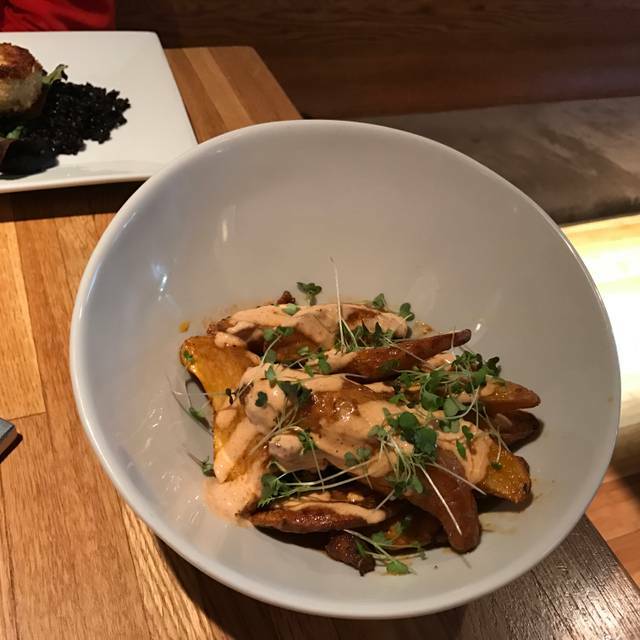 The food selections are always interesting, both small plates and entrees, and the menu changes quite often so that one never gets bored. The staff are wonderful, friendly, and attentive, and never miss a beat. If you have room, try a dessert -- the butterscotch pudding is out of this world. Love it here. Excellent food, neighborhood comfort, easy parking. Wonderful menu options. 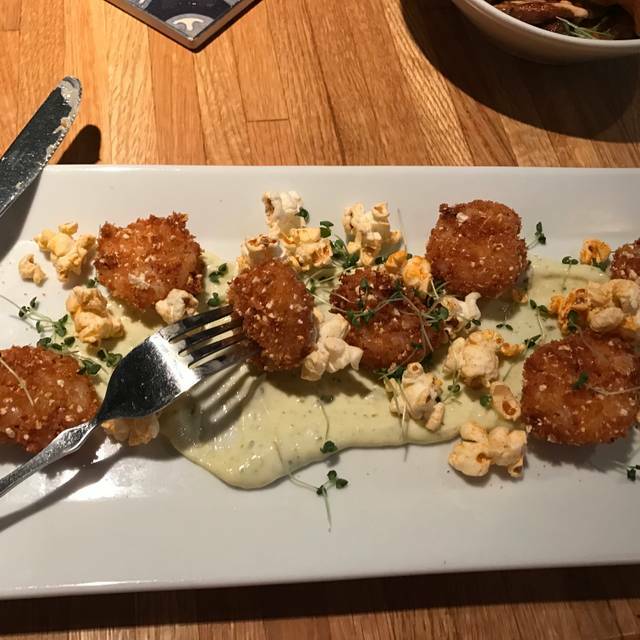 Small plates are fairly large. Frankly, you can get away with one and can share a vegetable plate or the tasty spaghetti squash. The bison bourguignon was meaty, tender as was the cauliflower risotto. Pea soup was a tad cool and very salty. The four of us weren't impressed by the average pour of a glass of wine (at $12+) ... a little small ... We ate very early, 5:30p - it being a Saturday night and with the high ceilings, jazz music, tile floors and no sound buffering, I'm sure - with the inability of people to have what used to be called 'inside voice' - the noise level by 8 pm most likely reaches that of a leaf blower. The music (not my taste at all for dining) and loudness was already going up by 6:30p when we finished. We had a very nice experience, however, and will return. But, if you do enjoy conversation with your meal (with wine, easily $35-40pp), I suggest earlier rather than later. Or learn sign language. It was our 1st time at the restaurant. It was Valentine's Day and they had a limited menu. Food and service was very good. We did not expect a tapas menu and servings were quite small, even for tapas. We will try it again to get a non-holiday broader menu. Terrible portions, significantly overpriced, poor service, poor food quality. Very disappointed. Please see detailed review on Google. The food was not spectacular as expected from the website. Just average for Asheville. The restaurant was not crowded at all, but the wait staff didn't visit to refill drinks, etc. For the money, pretty much any other indie restaurant would be a better value. It was my daughter's birthday and Mike, our server, was terrific. We enjoyed the food, she loved the birthday cake, and our overall experience was delightful! We'll definitely be regular customers. Thanks! Ambrosia is a neighborhood casual Bistro located in North Asheville, North Carolina. There were seven of us and we went for burger night, a choice of three burgers and a half pint of beer for $10.00. Delicious burgers, they let us ladies substitute fries for a house salad, the buttermilk dressing was delicious. My only complaint which is MAJOR and needs to be correct ASAP. The address is not visible from the street and the lighted billboard for the entire shopping area has no address. Unfortunately, one person in our party got ill and we called EMS and they could not find us, I had to go to the street and jump up and down in the dark so they could find the Bistro. Not really their fault but they need to notify there landlord immediately. Have never had anything less than a really good meal at Ambrozia. Their Sunday brunches are absolutely fabulous. Burgers are always outstanding. Plus, the chef usually has some especially and innovative specials added to the regular menu. The table bread is amazing, short rib appetizer was great. Entrees were ok, I have had gnocchi many times before but this time the mix of vegetables was not as good as usual. 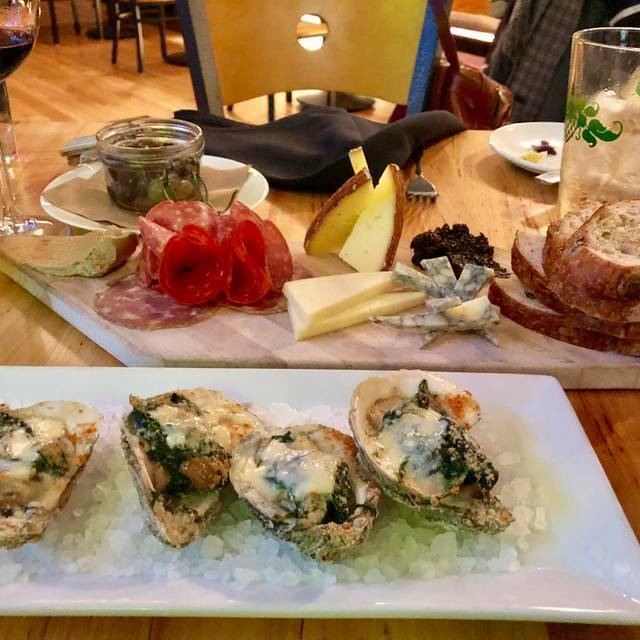 We chose Ambrozia for a girls night out, to take advantage of Asheville Restaurant Week. None of us had ever been before and were excited to try to. We were not disappointed. Services was excellent and all the foods were delicious. We had to opportunity to try a new restaurant and we all said we will be back soon. Thank you for a lovely evening and a great experience! The atmosphere and the service we're really good. Cute little place with a hip vibe and low lighting. The dessert was excellent, however I felt the rest of the meal was decent, at best. Overpriced for what it was but overall not a bad experience. But it didn't blow me out of the water either. Loved the trout and dessert, chocolate mousse and hole donut. My husband loved his steak and lobster bisque. My Wife and I have dined here in the past, but not for awhile. So, we thought that we'd try it again for Restaurant Week. We weren't disappointed!! The food was well prepared and of high quality. Our Server was excellent as was the wine selection. It was Restaurant Week. The only issue was they were out of sparkling water other than club soda. Overall it was a pleasant experience! Great neighborhood spot with interesting food and pleasant, professional service. we'll be back! It was great- we were 11 people and they handled us beautifully. We enjoyed brunch today at Ambrozia and it was excellent. Our only complaint, and we have experienced this before at Ambrozia, is that the live music was too loud to enjoy conversation at our table. We did ask our server to ask that the music volume be lowered & that happened for a while but then crept up again. Upon leaving we noticed that we were the only ones dining on the side of the restaurant with the live music - next time we will ask for the “quiet” side too. I personally think that for Sunday brunch classical music piped in would be perfect! Love it. Our go to on any evening. Gnocci is my favorite, Steve loves the short ribs or Benn's fried chicken. I'm fond of the half priced wine night. Can't go wrong here. Jonathon is one of our favorite servers. They're all great though. Enjoy!